Golf: Mixed fortunes on a long trip – HubNut – celebrating the average! We spent the past two nights in Devon, wisely choosing to head down late on Friday night to avoid the worst of the Bank Holiday traffic. The drive wasn’t entirely joyous with the biggest problem being that the rear brakes were making a horrible squeaking noise. I’m amazed it didn’t drive us mad. I desperately tried to slacken off the handbrake at one point, thinking maybe it was dragging a bit. Nope! We squeaked onwards. Thankfully, the noise was much reduced at motorway speeds, so once we hit the Blue-signed highway, our sanity was in much less danger. Then, as it got cooler, Rachel noticed that moving the heater control did not make it any warmer inside the car. Bother. There was nothing I could do about the heater, but I did decide to investigate the rear brakes yesterday, before folks started arriving for a family party. You would have thought that such a horrible, incessant noise, made during a 160-mile journey would leave some evidence. Not a bit of it. What I suspect is that the wear edge on the drum is catching the shoe and setting up a high-pitched hum. With this in mind, I borrowed some sandpaper and attempted to knock the edge off the lip and the shoes. Ultimately, new drums are going to be needed I suspect, but I had a party to get to. I put it all back together, re-centered the brake shoes and took it for a test drive. Negligible improvement. However, on the trip back home today, it was far better. Thank goodness! Sadly, all was not well. The ride is hopeless. It’s pretty firm, but hitting a cat’s eye on the motorway feels like running over a brick. Clearly, something is amiss. It handles well, so I wonder if someone has fitted stiffer springs. I also suspect that mountings and bushes are far from healthy. On the plus side, having got back home, I set about removing the heater bypass valve. This is fitted because apparently Volkswagen got the spec wrong for the heater matrix, and it can explode under pressure. This is considered a bad thing, especially as if it happens, it’ll dump scalding hot coolant all over the occupants. It has happened and the results are not desirable. 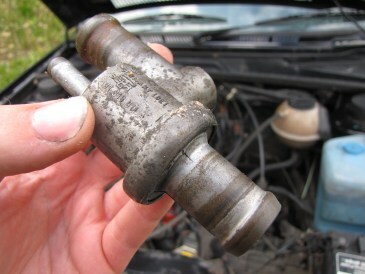 Volkswagen responded by fitting a load-restricting valve to ease pressure on the matrix under recall. I have a lovely, working heater again now but am considering the long-term solution. I either stump up for a second-hand valve and hope it works, or fit a Mk3 Golf heater matrix, which is stronger. Faulty valve removed. 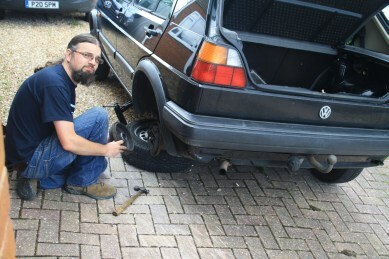 A recall fitment to stop the heater matrix exploding!